I was born and bred in in Dublin, so today of all days, I felt I had to have an Irish card on display. Trinity College, Dublin, the library of which contains the Book of Kells, one of the world's most beautifully illuminated manuscripts. The campanile houses the great bell of the college. Built in 1853, it also contains the smaller provost's bell which may have hung in the monastery of All Hallows, the site of Trinity College. The great bell is rung before each examination and for commencements, the degree conferring ceremony. Trinity is not only a place of learning, but also has such interesting history and attractive buildings that it has become a place to visit. The book of Kells may be one of the big draws, but I'd love to see the Old Library and Oscar Wilde's birthplace in Westland Row, now the Oscar Wilde Centre for Irish Writing. It was always expected that I would attend Trinity College. My parents, my teachers at school, everyone expected it. Everyone except me. I had a rebellious moment and decided to go to Liverpool instead. I is for Ireland. A post for ABC Wednesday. And still more postcards from Ireland. Well, this IS most apropriate. I talked about the Irish myself. I'm Irish, too--though I was born here in America. Dad often speaks of our heritage, and someday I'd love to visit. It is a very fair country and the people are wonderful and brave. I was waiting to see what postcard you would post for today. As usual, you didn't disappoint! Thanks for an interesting read. I have given you a "Sunshine Award" and linked to your blog in my latest post at the http://vintagepostcardsrevisited.blogspot.com/2010/03/i-received-sunshine-award-i-need-some.html. You can pick up your award there. This is nice! I'd really like to go to Ireland one day and see all its sights.. Indeed a very fitting"I" for this week's abc round! Very informative post! The architecture of Trinity College is quite beautiful. What a fun blog. I like the old postcards the best but it is fun to see modern ones from different locations too. What wonderful memories this brought back to me! 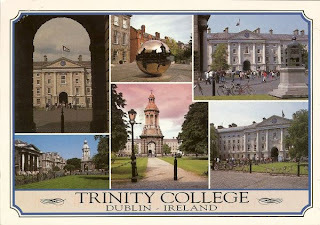 I spent my third year of college (university) at Trinity College in 1968-69. It was an exchange program through the University of California, Riverside (as well as all the other UC campuses). My mom saved all the letters and postcards I sent home. It was such a great year! Thanks for the memories you brought back.